For the first time in decades, Chevy and Chaparral, the racing pioneer, teamed up once again to design the Chaparral 2X VGT (Vision Gran Turismo) concept, which debuted this week digitally and in the flesh at the Los Angeles Auto Show. 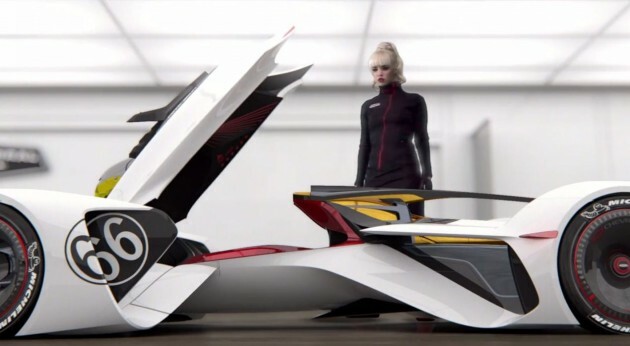 The point of the concept was to envision the future of racing technology, and, while the Chaparral 2X VGT concept may seem a little outlandish, it definitely demonstrates remarkable thinking and exciting innovation. Why does it seem a tad outlandish? Well, for one, lasers power the concept via a laser-propulsion system. And the driver isn’t in a seated position, but instead is on her stomach, arms and legs splayed like a bat in flight, with her head sticking out the front and with her helmet screen displaying all the information she needs. But none of that matters. The point of the whole process of developing a Vision concept for Gran Turismo was to “find new roads” of innovation, new avenues that had not yet been explored. Chevy and Chaparral delivered. To generate more excitement about the video game car for Gran Turismo 6, Chevrolet released this Chaparral 2X VGT video that demonstrates the design process and, more excitingly, how it handles on the track. And the best part? It’s got a score that is seemingly straight out of Inception to build excitement. We were kind of just waiting to find out it was all a dream.